We all know computers have evolved so much in the recent times. The technology is keeping on improving and upgrading. Well, well, I cannot write more about it; in the era that you are reading this, it is the configuration which you won't even recognize I guess. Anyway, feel free to use the guide if you want to buy laptops. And wait! Just wanted one great point of comparison to be added. Any guesses? Mmm no I think. You see that I had 1 GB Hard Disk Drive at that time. The comparison is that the current computer I have has 2 GBs of RAM! Well, forget it; even the laptop I currently have has 1 GB RAM. What a change! I'm again linking to the wonderful guide on buying laptops. Hope it will be useful for you. I'm a photographer, and find it difficult to publish text-only posts :) So I am publishing a photograph also. I took it about 2 months back when I was assembling a computer for one of my clients. 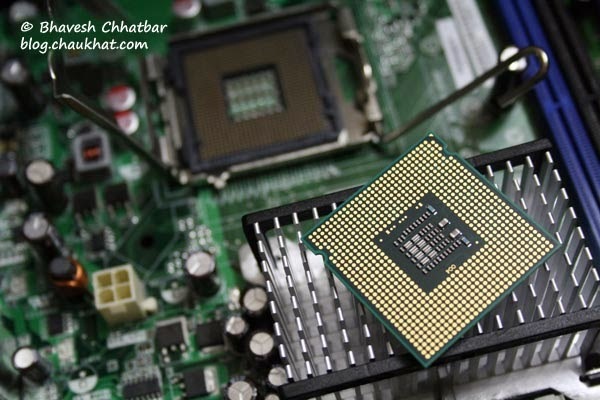 The following photo is of Intel DG35EC Motherboard with Intel E7400 Core 2 Duo Processor. Being computer illiterate I don't understand much about computers, except turn them on, type and turn them off! haha!! Anything more complicated and I'm lost...so where am I anyway? Times have definitely changed. I bought my first computer in 1985. It was a Radio Shack brand, ran on DOS, and had maybe 400 mb of memory total. Pretty pitiful by today's standards. I should have kept it. Would be an antique by now. I remember 386/486 computer but mine is P4 - I purchased 4 years back. I skipped all those early years of 486 and so. Great post and blast from the past! plz chk my blog and sign in my blog.. In the late 1980's, I was working on a 286 AT with a 5.25" floppy disc drive. No Windows, everything was DOS based. Wow have times changed. back then, we even had the 10.5" floppy disc drives for storage. I too took a photo of the inside of my new PC. I had the power supply replaced and added 2 gigs of RAM. this is a neat document of what was going on at this time in your life. please keep adding photos! Well this was interesting. I can't even remember our first one...back in the early 80's at least, some kind of ..oh gosh..forget it..can't remember. Then of course moved on to upgraded desktops and now I have my beloved laptop. Well, i really didn't remember my first one , though i even can't . Its just because i am really into upgrading my systems every moment i get a chance. A number of manufacturers name their batteries smart for the reason that their batteries include a pre-programmed chip that sets the charger as per standard requirements. The majority smart battery chargers are proscribed by the parameters of the chemical cells and once the chemical cell has ruined, the laptop battery has to be distorted. In a number of situations, the chemical division of the battery can be completely reinstates but the fuel gauge might turn out to be erroneous or other data might get corrupted. In such situations, although the digital readout becomes erroneous because of fault, the battery would still completely charge and function on average for some time.